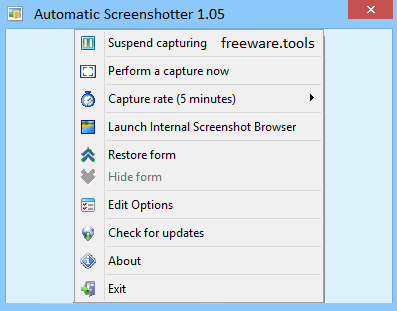 Automatic Screenshotter is a screen capture utility for taking screenshots at regular intervals. The program runs in your system tray and takes regular screenshots of your desktop or the active window every few minutes. You can customize the capture interval and also create application rules that let you skip captures when certain applications are open or only capture screenshots of specific applications. In addition, you can set capture rules that automatically suspend captures if your computer is idle, if you are playing a full-screen game or if your screensaver is running. Other features include customizable capture intervals and file name options and more. In addition to helping you create a user manual or a how-to guide, screenshots can also act as a visual aid for explaining certain functions, processes or issues you are dealing with. Automatic Screenshotter is a lightweight application that enables you to take snapshots of your entire desktop or only a few active windows for the purpose of monitoring system and programs' behaviors. After a fast and straightforward setup, you can access the application from the System Tray. While it is set to be minimized to tray by default, you can also hide it from the taskbar so it does not distract you or, on the contrary, keep it on top of other windows, depending on your needs. Although it is designed to work in the background, the tool comes with a report window where you can check out various details about its activity, such as space used, number of files, their location on the local drives and the actions performed during the last session. The high spot of the application comes from the fact that it allows you to capture the actual windows you want. You can specify the active windows you are interested in grabbing from the Options window. In addition, you can select to have automatic screenshots at specific intervals, meaning every 5 or 10 seconds, 1, 5 or 10 minutes and 1 hour. The app also enables you to take snapshots at any desired time manually, a feature that can surely come in handy when you want to capture certain error notifications so you can get help from friends or on the forums, for instance. The screenshots can be saved as PNG or JPG or a mix of both image formats, a preference that you can specify from the Options window. All in all, the app allows you to capture active windows or the entire desktop using your own parameters. Therefore, Automatic Screenshotter could lend you a hand when you are monitoring particular application or system behaviors.